Cornelius K.G. Billings, one of the several wealthy men for whom he designed grand estates on the Gold Coast of Long Island, commissioned Guy Lowell to do two mansions. The first was the famous “Tryon Hall,” high above the Hudson River on the site of Fort Tryon (1907). The second was “Farnsworth” in Matinecock, Long Island (1914). Classically designed interior and exterior fountains and water elements in both homes were the sites of several sculptural pieces. When Billings retired in 1917 to Santa Barbara, CA, he again made use of Lowell’s genius. 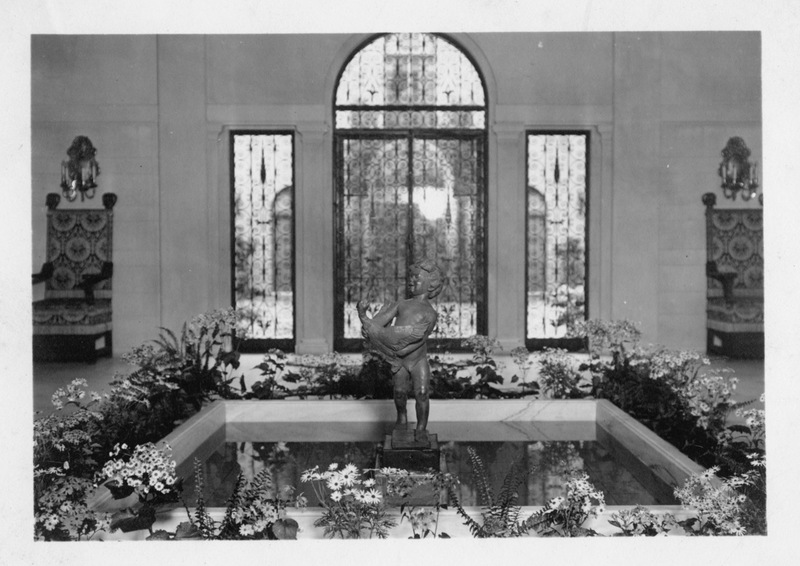 Allen’s “Duck Boy” was chosen in about 1924 for an interior marble pool surrounded by flowering plants. Billings spent the rest of his life by the water in this house in the company of the happy chubby boy and his duck. There is a question about whether one of Allen’s sons may have been the model for the child. A note on the back of the photograph notes, “Gordon Frederick posed for her” below the erased name of Mary Henry Moore, the only daughter of the British sculptor Henry Moore. Frederick, then hardly two years old, could have been the curly-headed, chubby legged boy in the fountain, but it might have been his older brother Gordon, then about five. Alternatively, the note may refer to Gordon posing for Mary Moore. Like his garden sculpture of Cupid or Eros for Arthur V. Davis and his fountain Boy with Goatskin for the Piping Rock Club, Duck Boy is a classically designed sculptural figure comfortable in American Renaissance architecture and gardens. Beaux-Arts style bronzes with a uniquely American twist were the popular choices for these tasteful settings. The American stamp, while still respecting classical beauty, was to be realistic and natural. Emotion was to be expressed by the sculptor and evoked in the viewer. Sculptors and painters wanted to capture the spirit of the moment. American sculpture was tactile, sometimes rough, often sketchy, allowing the viewer to feel the clay and participate in some way in the process of sculpting. 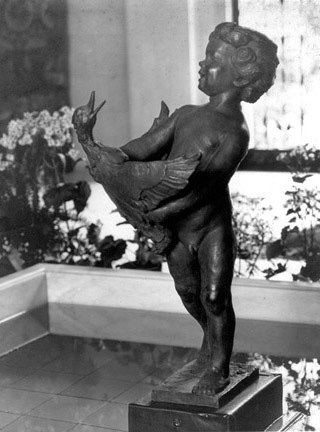 Duck Boy bronze fountain figure by Frederick Warren Allen, Sculptor, 1924. Purchased by Guy Lowell for the Santa Barbara estate of Cornelius Billings. The Duck Boy is a beautiful child, a happy child delighted by the energetic flapping of the duck’s wings as it tries to take flight from his grasp. He laughs and the duck quacks. They lean away from each other in an upward vortex of movement spinning at its tip where the child’s feet are braced together to support the upward force. Look at the textures. The duck is rough, ruffled and angular. The boy’s face, neck and shoulders in contrast are plumply rounded, smooth and shiny. Natural elements show in the dimpled fattiness of his legs and lower belly. Note the sketchiness of the feet, feathers and hair. The details are subordinate to the movement within the piece that explodes outward in the joyous struggle between boy and bird. The composition balances on an imagined centerline of the vortex of upward movement. The mass of the child’s head at the perimeter of the top of the vortex appears to increase the centrifugal force with its weight. The torsos of the bodies of the duck and the boy form angles, which press outward from the center forming the cone of the vortex. The straight lines of the wings and arms pushing away from each other give structure and stability. The legs planted together at the rectangular base form a solid column of support for the energetic activity above it. The whole is balanced. If the base were taken away, it would still stand.